Following the departure of Superman and the old guard of heroes, a new generation is content to play judge, jury and execution by killing its enemies. 10 years have passed and a battle in the heartland of America results in a nuclear explosion that wipes out millions of people and effectively obliterates stockpiles of America’s food supply. At the urging of Wonder Woman, Superman returns to try and sort out the mess, but the world is a very different place from when he left. 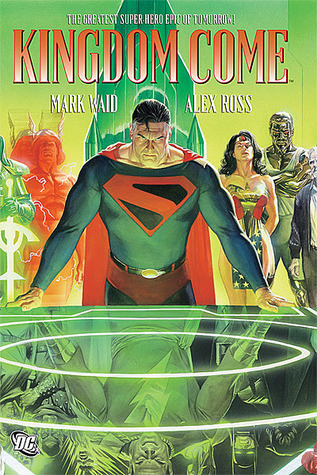 Can Superman relax tensions between humans and meta-humans or are we on the road to Armageddon? One of the big draws to this book is Alex Ross’ artwork. Ross has a very distinct style that complements the epic scale of this story. The heroes look larger than life, the worlds appear lush and fully realized and it just looks.. real. Because of this, there are a few scenes that certainly benefit from this type of realism. My jaw dropped on a few occasions. That being said, this is not something I would want in all my comics. Ross’ style can certainly elevate a story, but it definitely wouldn’t work for everything. However, after finishing this book, I immediately requested his acclaimed 1994 series MARVELS that tells the stories of heroes through the eyes of an ordinary citizen. I didn’t care much for the ending. I was all set for things to get unapologetically dark before things seemed to wrap up a little too nicely for my taste. I had the same problem with Superman: Red Son where the author felt the need to make the ending much longer than it needed to be. I had flashbacks to 2003 sitting in a darkened theatre at three in the morning questioning my sanity by choosing to go see Return of The King at midnight when I had to work at 8am. In the end, I really did like this, but would have preferred they took things in a darker direction for the finale. I am a sucker for these “Elseworlds” stories where authors get to take liberties with characters and establish alternate realities where things truly go off the rails, like in Flashpoint where Bruce Wayne’s father ends up as Batman. Also, can we talk about Superman’s ponytail? What’s up with that?